A refrain that we’ve heard often over the past few months related to the current SDN/NFV hype is that operators are looking to their equipment suppliers to help them inform their virtualization strategies. Conversely, we’ve also heard that vendors are looking to their customers for guidance on how to prioritize their SDN and/or NFV solution development roadmaps. Chicken, meet Egg. Additionally, from its recently concluded analyst conference, AT&T related that, among other things, initial instances of virtualization could be well applied to functions such as encryption (i.e., specific functions that today reside on specialized hardware, but could be deployed on software via COTS hardware). Reading between the lines, this makes sense on a number of fronts. 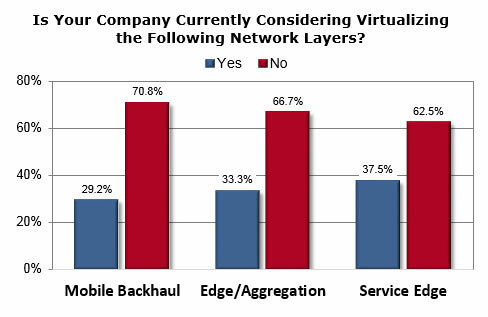 First off, from our own research, we know that where operators are actively considering virtualization, about 2/3 (on a global basis) are targeting areas such as mobile backhaul, aggregation and service edge functions for virtualization. This would be consistent with the guidance given by AT&T’s Domain 2.0 program outline. Next, we also know that operators are going to first target functions in which specialized, dedicated hardware is not necessarily required to meet extremely stringent latency requirements. Per the operator’s recent example, encryption can reasonably be grouped into that category. So, what’s it all mean? Perhaps obviously, it means that AT&T is gearing up to name suppliers to help it target specific aspects of its mobile core for virtualization in the relative near term. No big insight there, right? Or is it? If vendors are looking for messages to take to Mobile World Congress in February 2014 (and they are), and if operators are looking to take guidance from first movers (and they are), then AT&T’s recent moves are probably as good as it gets in terms of the guidance that operators and NEPs alike claim to crave when it comes to helping them craft their near-term SDN/NFV strategies. Have some SDN/NFV thoughts (and we know you do). Share them below. Previous postSmall Cells: Will Operators Be Willing to Share?